It’s all coming out now, the narcissist in me:) This is a screenshot taken from my LinkedIn profile. I did it really because I liked the colours. I’m quite a simple guy tbh. 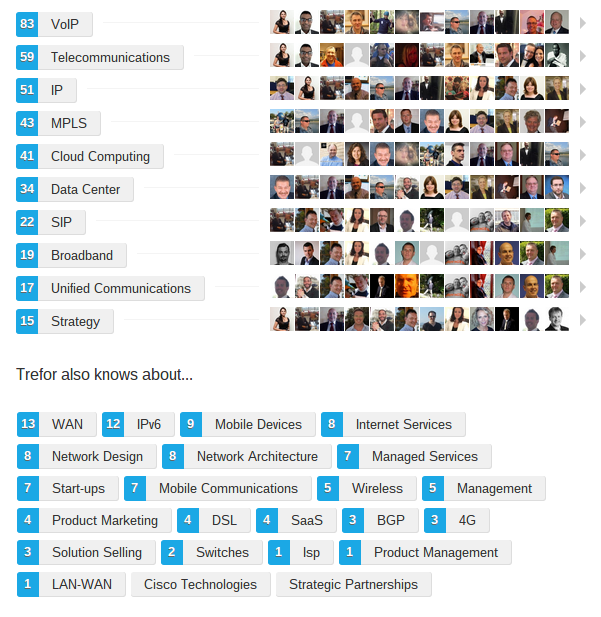 I spotted it when looking to see how many LinkedIn connections I have fwiw. I’d spotted an old friend and colleague in my timeline, dropped him a note and then drilled a bit more into my connections. Whilst I have been around the block a few times the endorsements on LinkedIn do have to be tempered by the fact that one does get endorsed as knowing about a particular subject by people you know who clearly know nothing about it themselves. Hey let’s not be ungrateful eh? Disappointingly nobody has endorsed me for my poetry. I can understand that no one would do it for my golfing prowess. Poetry is an important part of the workings of the internet industry as attendees of RIPE meetings will know (if you don’t know about this it’s a secret and you’re not in on it). Beer is the other important bit. Not quite sure how “Cisco Technologies” and “Strategic Partnerships” make the list as they don’t appear to have a number next to them. I should have been shouting more about my Strategic Partnerships skills obviously. I did used to have a Cisco router at home and Timico’s network was initially built around Cisco although that company has lost ground in the core. I have started to get more out of LinkedIn over the last year or so. There seem to be more LinkedIn shares on the blog than any other social media platform. When you think about it this is a good thing as I whilst I do indulge in consumery stuff the more serious content of the site relates more to business. VoIP tops this list of endorsements. I guess this is appropriate as I’ve been “doing” VoIP pretty much since it all started. If anyone is interested in coming along to our VoIP workshops, done jointly with ITSPA the next one on October 7th at Sandown Park Racecourse. It’s timed to coincide with Convergence Summit South. Look out for details on this blog. Anyway got to go. I have an appointment with a therapist who says he can cure narcissism. Btw my wife, who has probably never heard of LinkedIn, should note that none of the endorsements are for plumbing, diy, painting and decorating, or a miscellany of other skills required to maintain the smooth running of the Davies household. I will acknowledge “changing light bulbs” and “mowing grass” as among my core competencies. PS the one skillset that perhaps should be on the list but isn’t is in writing. Maybe that isn’t available on the LinkedIn list. Or maybe you are all trying to tell me something (scampers off with tail between legs). Check out the trefor.net Technology Marketing services we launched last week.